Indian Vanity Case: Bought An INGLOT Eyeshadow Twice By Mistake! Bought An INGLOT Eyeshadow Twice By Mistake! "I've never spent this much time on one customer." In the end, it came down to one eyeshadow. One. 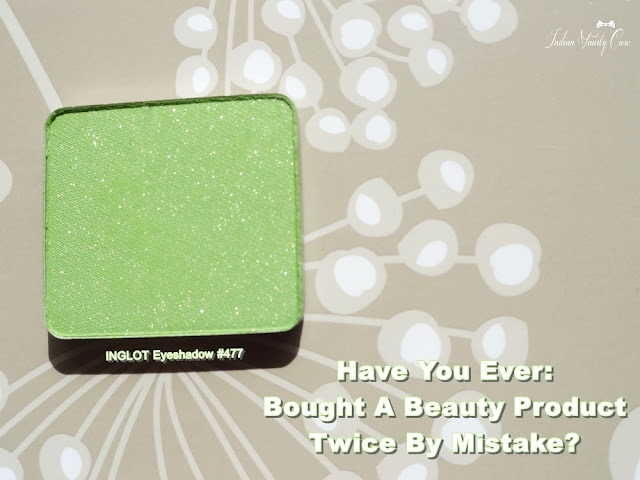 He said pick this beautiful bright green shade- 477.... and I did. It was finally over! I left the store - feeling free! No, wait. There's another feeling.... something is not right. I think.... ooh, ZARA! I went home and browsed my own blog.... then I saw the "feeling". I'd already bought this eyeshadow before! It's kind of okay though, because I'd sold my other palette in a blog sale....and it means I really like the eyeshadow, right? But still, I feel stupid....and old! How could I forget? Has something like this ever happened to you? I'll hit myself if nobody says yes. Hahaha.. I found the last sentence in the post hilarious! Years ago, there was an offer at Health & Glow - a pack of 2 lip glosses - one free with the other. So I bought it thinking, I could use the pink one and my sis can use the brown one. Perfect right. Then later than evening my sis comes home from work and says - hey there was an offer at H&G and I bought the BOGO lip glosses. Here is the pink one for you ! We ended have 2 pink and 2 brown lip glosses each ! Hahahaha! Gosh, that's too funny! That's some coincidence :D Well, at least you both have one of each! P.S: In my excitement I did not do a grammar check on my previous comment.. oops! :D you are funny Cynthia ! But honestly, this is what happens when makeup is named in numbers instead of words! You hear that Inglot?! YES you're are absolutely right! Names are so much easier to remember...sheesh! Yes I've bought nail polish that I already had! This has happened a couple times! Lol!